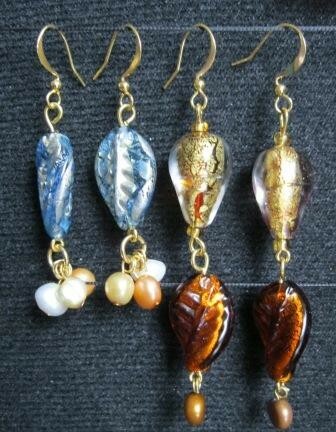 I thought I should include the link to my etsy shop. Well, I am back and bursting with crafty ambition! I know it has been a long time and I hop you will be able to forgive me. Living in Canada’s capital as I do, I have been in hibernation since the end of November. Though I haven’t been totally idle, I guess I haven’t really considered it enough to blog about. I should have enough now though, so let’s catch up! Since the last time we talked, I have gotten married, continued to work full time and hosted more than one large family dinner. 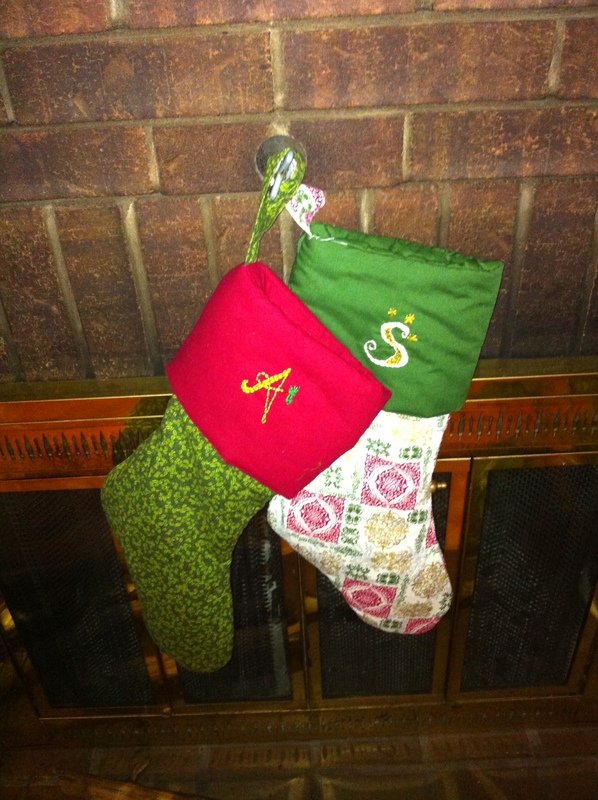 I have also started belly dancing and I have been doing some other crafts as well, including sewing two new Christmas stockings for my husband and I, knitting, and needlepoint. 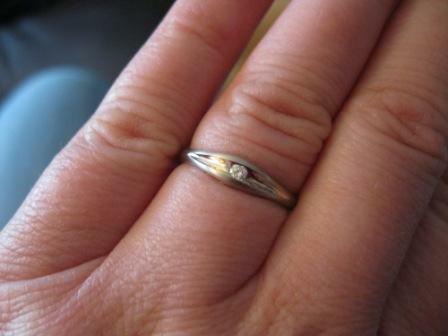 One thing I know I promised was a picture of my bridal jewellery, which I didn’t want to post before the wedding. It’s been 6 fabulous months as of today, so I think I can share it with you now. 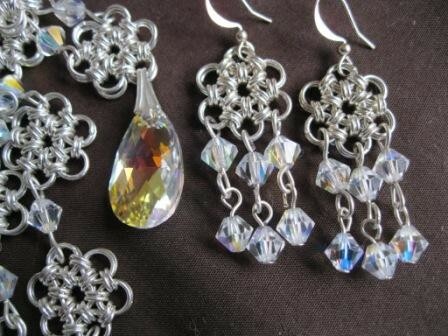 Its chain maille of course, but i got as much sparkle in there as i possibly could. 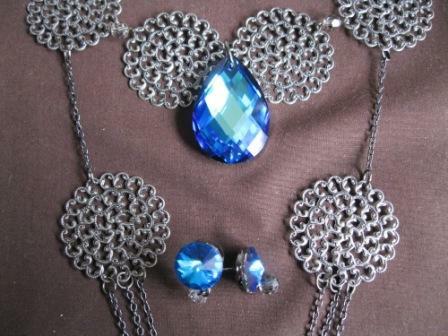 My Maid of Honour’s set was similar but with 1/2 coat jet hematite instead of clear ab and without the larger focal pendant. 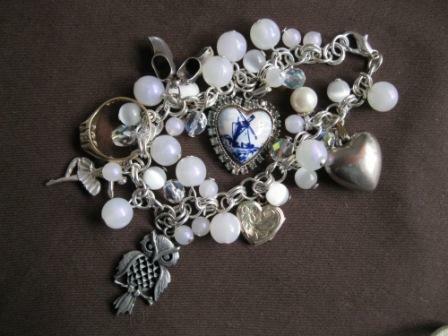 The charm bracelet is made up of a simple 6mm double ring chain and is hung with all of the pendants that my grandparents have given to me over the years. Sadly I lost my beloved Oma the spring before my wedding and my Nana was unable to attend. So it was important for me to have something they had given me be incorporated into my outfit. 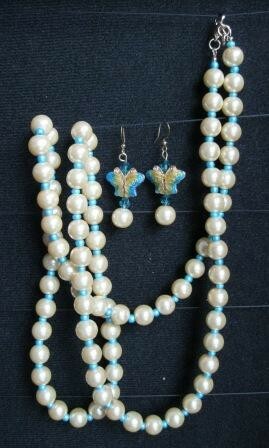 This included beads from a necklace my Oma had given me but had broken as well as my Nana’s original engagement ring. Sadly, my Nana also passed away last year. 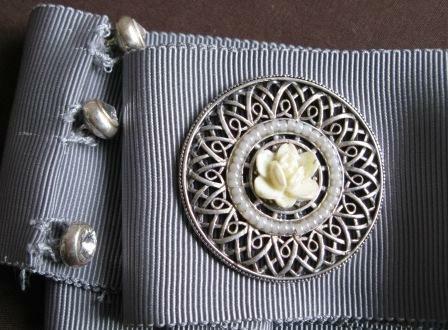 The pendant from my Oma’s necklace was worked into the belt on my dress. 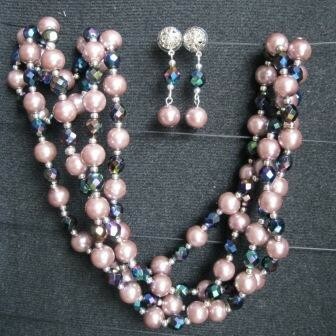 My second biggest beading challenge this year was the piece I came up with to wear to my work holiday party. They were taking us to the ballet to see the nutcracker so I decided this called for something truly over the top! 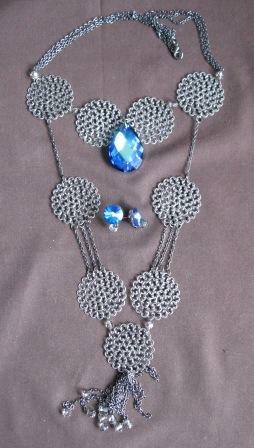 I knew I wanted chain, crystals and filigree and I wanted it to be actually worked into the garment. I had some grandiose ideas of incorporating it into a simple camisole and adding chiffon sleeves, including a lot of chain maille. However I got sidetracked by a fabulous dress at addition-elle and opted instead for that. It’s a bright blue satin strapless cocktail number with black lace up the sides. 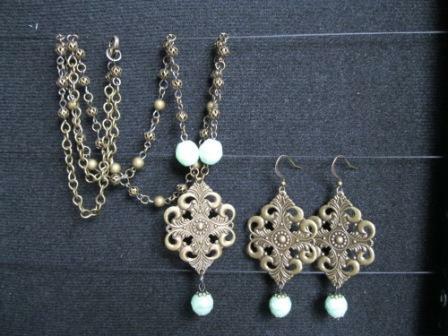 Lace plus filigree = YES! So off I trotted to McBead, dress in hand. 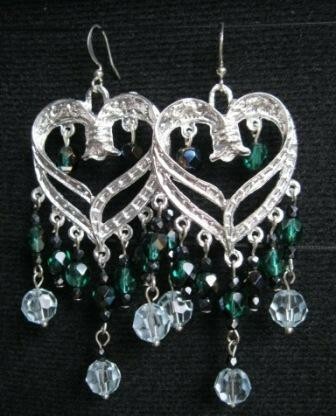 With Miriam (my boss’) help I picked out a stunning Swarovski bermuda blue tear drop pendant, black nickel chain, filigree pieces, and matching Bermuda Blue rivoli’s for earrings, along with some 8mm round Swarovski crystals in Silver Shade. With all the pieces in hand I thought assembly would be the easy part, after all, I had spent a long time playing with the shapes in excel mapping it out. Ummm…no. After the first assembly I realized that the large round filigree pieces didn’t sit the same way a 12-2 flower does…and excel doesn’t account for the way the piece sat on my chest. All in all it took several different incarnations to finally get the necklace to sit perfectly. The result? If that was the second most challenging thing, what on earth was harder? This is probably what you are asking yourself after reading that. Well the most challenging was in fact the McBead Creations Staff Bead Challenge. We were each given a bad with the same elements and had to create something using all of the pieces and whatever else we had in our collection that had also come from the shop. The customers would vote for their favourite by dropping coins into the box next to whichever one they liked the most and the money would go to the charity of they winners choosing. This was HARD! 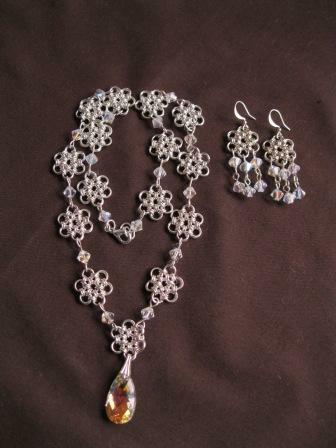 The elements we were given included a couple of large accent beads in a metallic look, some small acrylic beads, bead cones, some chain a small silver bow charm and various others. 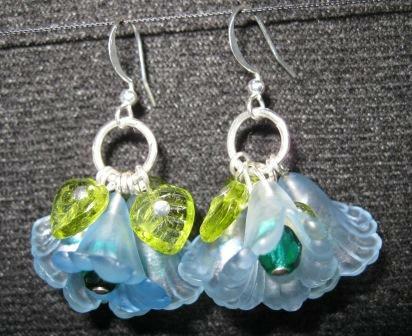 I spent hours holed up in my craft room on this one. I tried to match other beads in my collection to the elements in the bag, tried to work out a balanced piece with things that didn’t necessarily match. At one point I had something I liked but then remembered that the chain hadn’t come from the shop so I had to take it apart and start over (everything had to come from the shop so that if a customer wanted to recreate it, they would be able to). I must have assembled, disassembled and reassembled it 20 times before I was happy. The hardest part was finding somewhere to put the bow charm. It was worth it! Not only was I happy with the result and would totally wear it, I won the challenge! Sadly, I don’t have a picture of the results at the moment, but will try to get one for my next post. So that is the big stuff that I have been up to since last I wrote. I shall leave you with some of what I have created as well. And don’t forget to check out my etsy shop which is back up and running. 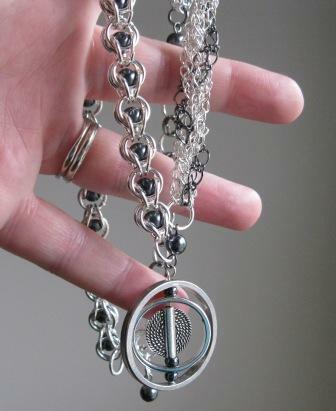 Made-to-order chain maille bracelets and new pieces coming soon.